I’m home from Moab, mostly against my will because I wasn’t ready to leave the desert. 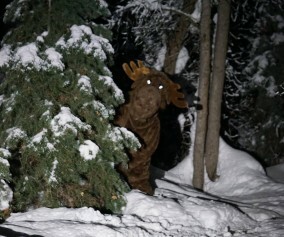 However, another Boulder runner that I met while camping kindly pointed out that my kids would notice I was gone. So… here I am. The race was amazing, and the people were incredible. 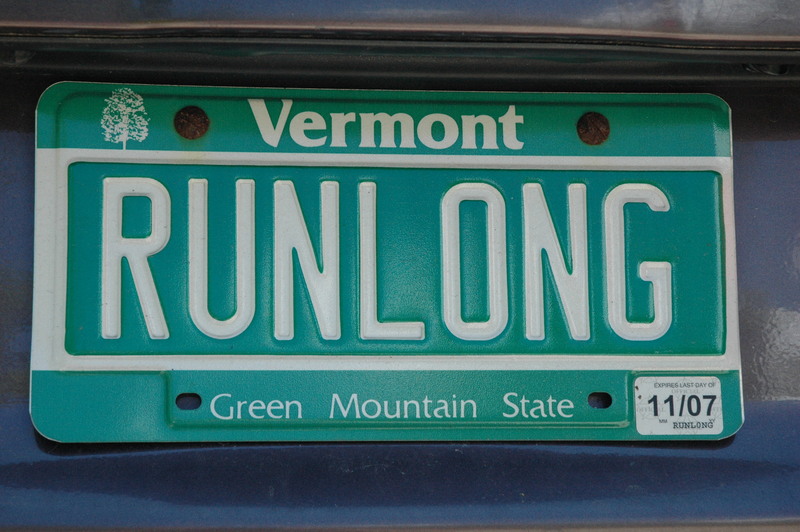 It’s a special breed of person that runs Ultra Marathons. These people are there because they can’t stand to be indoors, and they want to see what the world looks like away from the road. They go out slow and pace themselves accordingly. They’re friendly, and as soon as you start moving you notice that there are no masks. Not anywhere. Every person you talk to is 100%, totally real. They let you in and tell you how they got there, and what makes them move. 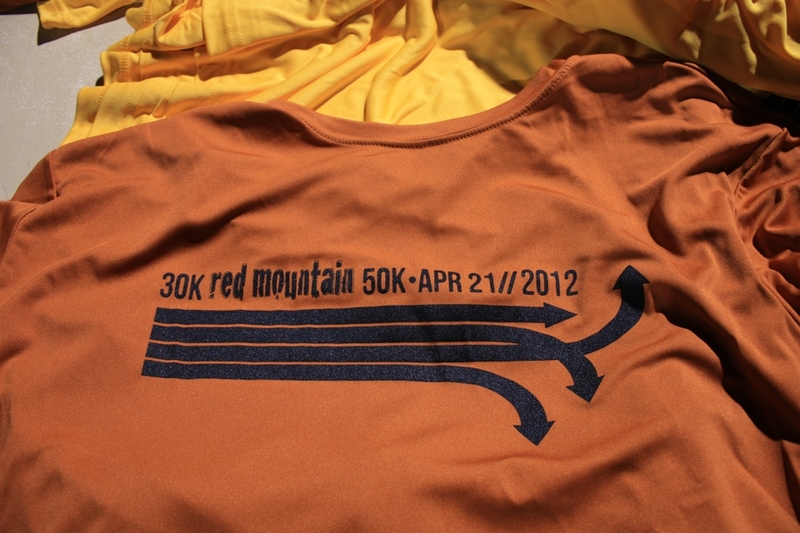 October 8 was the inaugural Slickrock 50k, 50M and 100M. 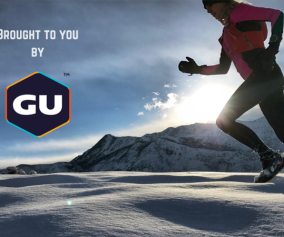 Being a complete novice to Ultras, I signed up to run the “baby”, the 50k. Due to unseasonable rain in the last two weeks the race directors changed the course for the 50M and 100M less than 24 hours before the race. The 50k people were still on the same course… mostly. They knew it was going to be a little long, but kept that piece of information tucked up their sleeves until after the 50k’ers came through the finish line. My Garmin clocked a total of 35.3 miles, making this the 50k that wasn’t. I pulled into the campground at 4pm Friday afternoon after poking around Moab trying to figure out where the heck I was going. I left my house with no map, no directions… just a general idea of how to get to Moab. I figured the rest would take care of itself. There were a dozen or so tents already set up when I pulled into a large turn-around with a horse corral off in the distance. This was base camp; the Start and Finish line would be in front of the large RV parked dead center. 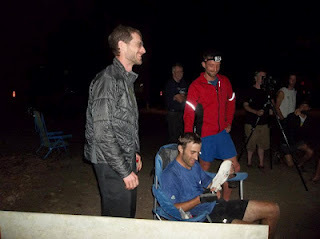 After checking in, signing a waiver and getting my bib number, I meandered off to pitch my tent. A few minutes later a guy in a Subaru pulled up. “Will it crowd you if I set up next to you?” he asked. “Nope. Go right ahead,” I said. As we worked we exchanged names and pleasantries, and found out that we’re both from Boulder. We compared notes about the trails and talked about our favorite loops. He’s mostly a climber though, and this was his first running race in seven years. He was supposed to have a few friends with him at the race, but they bailed. I was supposed to have a friend at the race, and he bailed. What a funny coincidence. At 5pm the race directors called a meeting, and everyone circled up to hear what they had to say. They talked about the change of course due to washout and quicksand, and how the 100-mile runners would now have 8000 feet of elevation gain instead of 4000, and how the last 4000 feet would be in the last 25 miles of the race. Uh-hunh… that sounded like a special kind of hell to me, and I said a little hallelujah that I was just doing the 50k instead of something harder. After a turkey-and-cheese sandwich dinner, my new friend Jesse offered to share a movie on his iPhone. Since it was only 7pm and already dark, I agreed and settled in to watch “Hanna” on a 3-inch screen. A layer of clouds moved in and the night stayed relatively warm. I slept soundly until 3am, when I woke up to pee. After climbing back into my sleeping bag I heard the pitter-pat of rain on the tent, and listened to it for almost an hour before falling into a light, dream-filled sleep. When my iPhone alarm went off at 6am I hit the snooze and lay cozy in my bed. What sort of crazy had I signed up for? It was raining, dark, and I was about to run 31 miles. This was nuts. 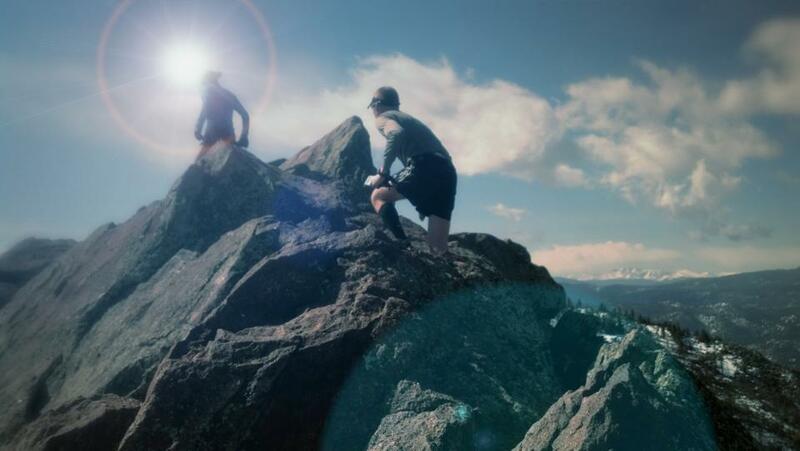 I sat up, strapped on my headlamp and dumped all my running gear out of the bag. I needed to rethink my clothing. Running through the desert in the rain for hours on end means that the temperature might dip, and I needed to be smart about staying warm. 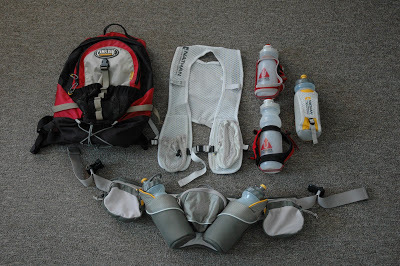 I could always take clothes off and leave them in my drop bag at the 11-mile Aid Station that already contained a dry pair of socks, arm warmers and a dry wicking t-shirt. Finally I decided to skip the shorts and wear my black running pants. If the sun came out and the temperature rose, I would just deal with it. Pants would ensure that my muscles didn’t get cold, a good thing when you’re trying to bust up a big hill in 40-degree weather that’s questionable. For the top, I decided on a light long sleeve wicking shirt with my light blue windbreaker. After pinning the race bib to the windbreaker I added a blue raincoat to the mix. The windbreaker would be soaked through in about a minute; if I ever got warm enough I would carry the raincoat or drop it at the Aid Station. Jesse and I meandered over to the start area and then somehow when I looked up again, he was gone. Two girls with pink tu-tu’s stood next to me. The air horn went off, a cheer went up and the race began. We started back up the road. The first (and last) 10k would be on this red dirt road with rolling hills. The morning’s rain had turned certain areas into soggy mud, and all the runners avoided the puddles. We came to the first section of the road that had been washed out, making the road a one-lane instead of two. The night’s rain had increased the size of the washout from yesterday, when I drove in. The pace was easy, nothing to it. 10-11 minute miles, loose and breezy. Runner’s quickly sorted themselves out, but I wasn’t in a hurry to get anywhere fast. This being my first Ultra, I had no intention of going out too fast. I didn’t know what lay in front of me and conserving energy was the name of the game. A few guys talked behind me, chatting about the Leadville 100 and the inclines on the Colorado mountains. I listened to the deep voices that flowed along behind my right shoulder, and got quiet. This race has been on my calendar for 9 weeks, and I’m here doing something bigger than I’ve ever done before. Don’t let the energy out to run amok; keep some reserves, listen close and rein in the legs. At the top of the 6 miles a few cars sat parked. A handful of people cheered for us as we made the first turn to run on the only stretch of concrete the 50k’ers would encounter. “Yay, Pink Hat!” someone called to me. The name stuck; several other spectators would eventually call out the same encouraging words to me, in honor of the pink hat I wore that set me apart from the other runners. At 7 miles I pulled over to pee behind a bush, then cruised down a little hill and entered a meadow. This was a flat 1.5 miles before we started climbing slickrock. The desert has some amazing rock that looks completely slick in certain light. A few days before the race a friend who has mountain biked through the Moab desert told me a little secret; slickrock is actually tacky. It’s sandstone, which means that your shoes (or mountain bike tires) will stick to the rock. Traction. Pre-race instructions told us to watch for the pink ribbons hanging from random bushes; they were our guides to staying on-course in the Utah desert. I wasn’t too worried about getting lost since there were at least a few dozen people in front of me. As long as I kept someone in sight, I would be fine. I chatted with a few people as we headed up the mountain. Megan was from Park City, Utah, and was running the 50M. I asked her why she ran Ultra’s. Vladimir was running the 100M and had recently done Leadville. He liked doing these races because it got him out of the busy travel schedule that kept him airport-hopping around the world. This was his connection to the ground, his down-time, his time to get his thoughts in order. He told me about the book “The Happiness Project”. I looked behind me and saw the man who had been talking behind my right shoulder on the first 10k pointing to the east. We were off trail, had missed the pink ribbons, and he was calling us back. I turned upwards and called to the next person; she telephoned the message up the trail. All in all we probably got 7 or 8 people to turn around. Everyone else was too far ahead. Megan and I went back to the turn and got on the correct trail. We didn’t go more than a quarter mile off course. No big loss. And up we went, climbing the slickrock. I ran slowly, efficiently, and listened to my steady breath. The mist was still coming down and the front of my raincoat was wet but not soaked. I was warm and content. At the Aid Station I checked my Garmin; 13 miles. 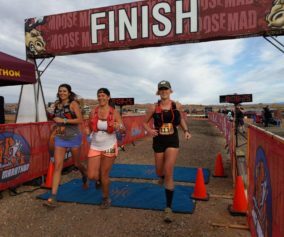 I had run a Half Marathon through the desert of Moab and was ready for more. Grabbing a few handfuls of potato chips, I considered the items in my drop bag and decided there was nothing I needed. Onward to the turn-around point at mile 15. The road flattened and the salty chips gave me a little boost. My pace dropped into the 9-minute range and cruising got stupid-easy. After a mile I came upon a guy standing there, looking backwards. He was worried we had missed the turnoff, but I was sure we hadn’t. We were still following pink ribbons. “What mile are we at?” he asked. “I think Gemini Road was back there,” he pointed. So Matt-from-Moab and I ran together. We talked easily for the next three miles, because the turnaround point didn’t come until mile 17.6. And now we knew… the course was long. I had been running for 3 hours and 15 minutes. A woman standing nearby poured some Heed into my bladder. I ate a few crackers and a slice of cheese, peed in the bushes and started the push back up the hill that I had just descended. Part two of the race had begun. That explained a lot about why there were so few people in front of me now. All the people that went out fast got lost and added miles to their route. We took off, power-walking down the slickrock. Her mouth was off and running, and suddenly I saw first-hand what Megan meant. Melinda, my new blonde friend, told me about every important event in her life that has made her into the person she is today, including being widowed at the age of 26, her daughter being born disabled, and her degenerative eye disease. We power-walked and ran together for the next 7 miles and discovered that I’m older than her by 10 days. We split up when we got to the road; I stopped at the one and only porto-potty while Melinda kept going. I never caught up to her; my reserves were taxed and I didn’t have any speed left in me. 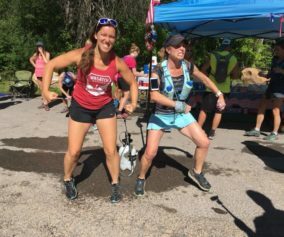 I ran 35.3 miles in 7 hours, and crossed the finish line to a handful of people clapping while standing in the red mud of the campground. The race director put a coffee mug in my hand, and that was the end of the race. No one was there for the glory of it… just for the experience of moving through the Utah desert, mostly because we’re alive and we can. The logo you posted at the top of the page is incorrect. The MAS50 is my race that has a great reputation. 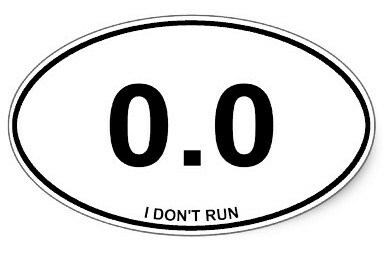 The event you have written about no longer exist, http://runmoab.com/, after it first year of complications. Sorry about that Chris. We removed the logo and want everyone to know that the logo we had posted was for Chris’s race and not for the race report above.